I knew they were writing a piece about us, but then actually seeing it was still a shock. Walking down the street to its a normal sunday morning, then I suddenly see a glimpse and then the flash of recognition: My photo on the front page of Sunday’s El Comercio – the largest paper in the country. In terms of exposure and distribution, its like making the Sunday front page of the NYtimes. I grab a paper and excitedly tell the slightly baffeled lady at the news stand – “LOOK! that’s me!” and she takes a look, and agrees, “wow, that is you” and I buy 4 copies right then and there. It’s Tuesday and the gray sky in Otavalo, Imbabura contrasts the bright and happy colors of the Plaza de Ponchos. Close by, to the west, in the Selva Alegre neighborhood, three women string with precision – using string made from pita fiber – seeds of various colors. They form delicate earrings, bracelets, and necklaces which are in high demand in boutiques in New York, San Francisco and other US cities. These women wear the traditional clothing of Otavalo: white embroidered blouses; black shawls; long silk skirts in blue and black, gold beaded necklaces and traditional black espadrille sandals. It is a simple house, one floor and with wide hallways and white tile floors, the Americans Joy Bittner and Emily Hockett promote the fair trade exporting of artisan-made jewelry. The purpose: to improve the conditions of life of the various indigenous families in the area. Bittner is 28 years old. Tall and skinny, her hair pulled back, she studied at Fordham University in New York. Here, she is the director of operations of the Andean Collection, which provides artisan-made products to Faire Collection, of the US. Take a tagua necklace, turquoise, whose pieces look like petals of a rose. They have worked in the past five years in Latin America due to the fact that things made by hand have a high value in the United States. Bittner lives in Quito. She spends two days a week in Otavalo to coordinate various tasks. 80 artisans, grouped into 13 workshops, working throughout the country. Along with her, in the U.S., widely known and well-regarded companies – such as J.Jill, Chico’s and Anthropologie- are enchanted by the products that they sell through their catalogs. A necklace made from tagua and pambil seeds is sold at around 50 or 60 USD in the US, while in Ecuador, they are sold at around 35 USD. “In Quito we sell our products at a store, Galería Gourmet, on Reina Victoria and Lizardo García streets”. Emily Hockett, 19 years old, will soon leave the country, to conclude her gap year with Global Citizen Year. She has lived with the Vega family. For Bittner, fair trade consists of paying artisans dignified salaries (more than the bare minimum), offering accounting classes to workshops, management of family finances, and scholarships for the children of the artisans. The profit from the exports – two times a month, by air, with more than 220 pounds of products- helps with this business. Cristina Fuerez, 28 years old, makes fifteen necklaces a day. She is content because this work has increased her family income. “My favorite design is the turquoise tagua necklace; the tagua is cut by machines into thin shapes resembling chifles [which are banana chips – a typical Ecuadorian snack food]”. Lourdes Picuasí changed her life and that of her three children. “They are fed well and go to school everyday”. Fair trade in Ecuador is a gold mine for thousands of families. 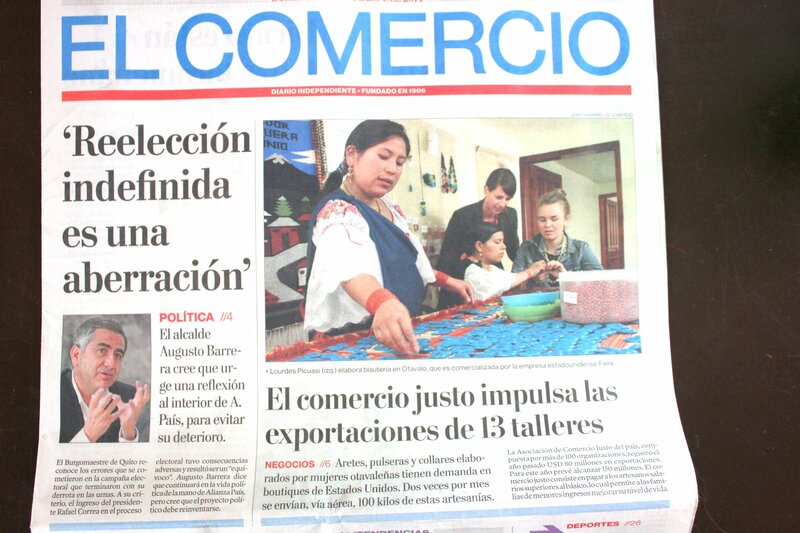 According to Luis Hinojosa, executive of the Fondo Ecuatoriano Populorum Progreso (Fepp), the exportations of Consorcio de Comercio Justo (Consortium of Fair Trade) add up to be 30 million USD in 2012, to Europe and the US, between private entities, with triple bottom line, older companies such as: Maquita Cuschunchic, Camaria (associated with FEPP mentioned above), Salinas, Sinchi Sacha y Chankuap (an exporter of products from the Amazon, based in Morona Santiago). It benefits 200,000 families. At the same time, the Association of Fair Trade, composed of more than 100 organizations, have sold 80 million dollars worth of products in the year 2013 and are projecting to sell 150 million dollars worth of products in the year 2014. The difference between the Consortium and the Association: the first is bound, for more than fifteen years, to the WFTO (World Fair Trade), global organization of fair trade. In the beginning of the 70’s, Mr. Cándido Rada (1905-1995) created the Fepp based upon the encyclical of Populorum Progressio, of Pope Paul VI, which demanded just wages for poorest people. “I believed in what nobody else would; doing good must be done well”, said Rada who was bishop of Guaranda and enabled the purchase of land. The Fepp awarded loans thanks to the bank that they funded. In Otavalo it is mid-day. A timid sun illuminated the garden, in front of the workshop in Selva Alegre. 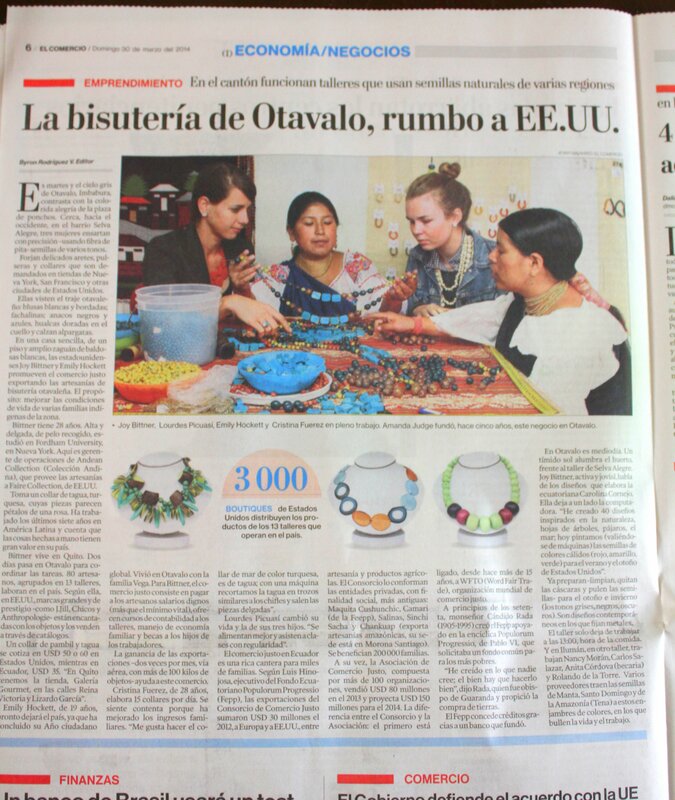 Joy Bittner, active and cheerful, talks about the designs created by Ecuadorian Carolina Cornejo. She puts her computer to the side. “I have created 40 designs inspired by nature, leaves of trees, birds, the sea; today we are dying (using machines) the seeds in warm colors (red, yellow, green) for summer and autumn in the US. They are already preparing – cleaning, taking off the shell and polishing the seeds – for the autumn and winter (gray, black, and darker tones). They are contemporary designs that use chain. The workshop stops work at 1:00 PM, lunch hour. And in Illumán, in another workshop, Nancy Morán, Carlos Salazar, Anita Córdova (scholarship recipient) and Rolando de la Torre work. They work withvarious seed providers from Manta, Santo Domingo and the Amazon (Tena) which give life to theplethora of colors with which they work.